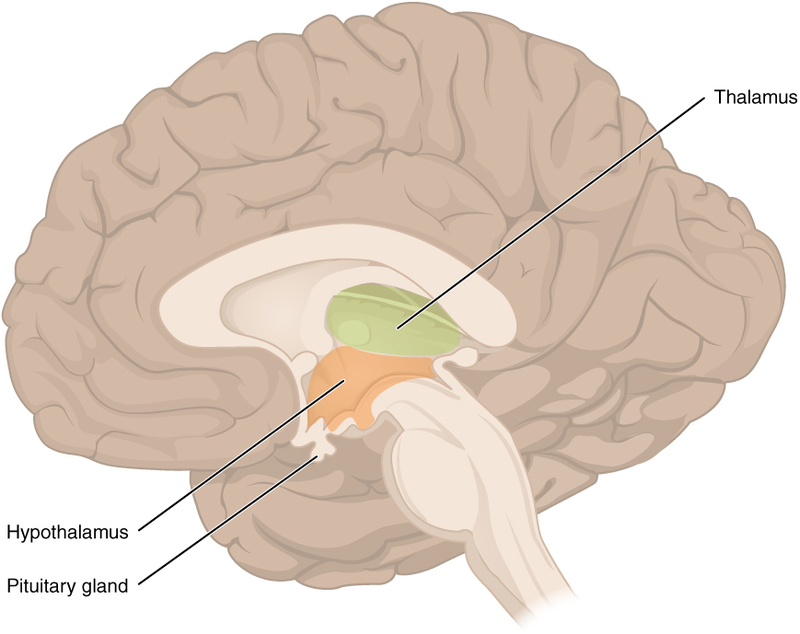 The thalamus sits above the hypothalamus and is often referred to as the "switching center" of the brain. It is sort of the central terminal where inputs from the lower centers of the brain including the spinal cord, brainstem, autonomic nervous system, hypothalamus and cerebellum are brought together and routed to the surface of the brain, the cortex. The thalamus also receives input from the limbic system, which is essential to memory and learning. Information from the autonomic system and the hypothalamus relay information to the thalamus about just how close your internal environment is to an ideal “perfect setting.” In other words: not too hot, not too cold, not too soft and not too hard”. This is perhaps perceived as your “mood.” Your thalamus is kind of like the United Parcel Service. It will gather information from various centers of the brain and spinal cord and will direct them to the correct address in the cortex. However, it does more than just deliver the package! It also wraps the package in an “emotional envelope” that sets the tone for its delivery and receipt. For example, you are sitting on a dark porch. A cool breeze blows across the back of your neck. The door behind you creaks. You hear footsteps. You turn to see someone carrying a shiny object. Now, if you have just watched a scary movie, this set of inputs may send shivers down your spine and set your mind racing in terror. But if you were waiting for your best friend to carry out a tray of cookies and cold lemonade from inside the house, this same set of inputs brings a smile to your face! In this case it is not the package but the “wrapping” around the package that means a lot. This may be a good time to begin to think about how the physical structure of the brain creates the metaphysical structure known as the mind. Our thoughts are more than compilations of sensory inputs from the visual world, auditory world, olfactory world, tactile world and the world of taste. We have learned that there are internal inputs from our autonomic nervous system, hypothalamus and brainstem driving us to maintain homeostasis. There is a long list of memories charged with emotional content that flavor our thoughts. Similar to “pop-ups” on a computer screen the thalamus “pops” information up to the cortex all the time. The cortex may serve as the screen on which the pop-ups appear, but who or what is watching the screen? And where that entity resides is a big question. The lesson to be learned is that the brain and the inputs it receives, both external and internal, are part of a physical organ that is less than a greater organ, the mind. We can only hope that our mind and in turn our behavior is not controlled by the impulses our brain receives but by the controlling entity, the self. Your job is to discover your self.